Woods Hole Group Proudly Announces: Woods Hole do Brasil Ltda. Woods Hole Group has established a new entity in Brasil. Officially, the new organization is Woods Hole do Brasil Ltda – Servicios em Oceangrafia. Brasilian law requires that a description of the company’s activities be incorporated into the name and also the word “Group” is not allowed in the official registered name. We will do business as (dba) Woods Hole Group do Brasil Ltda – Servicios em Oceanografia. All the legal documents have been filed and we are clear to conduct independent business in Brasil. For the past three years Woods Hole Group had been working in Brasil as a subcontractor to C&C Technologies (Lafayette, LA and Brasil). Woods Hole Group is currently working jointly with C&C Technologies on two large, multi-year contracts and will continue to work on these and additional projects with C&C Technologies. These contracts have allowed Woods Hole Group to become acquainted with doing business in Brasil and to establish many contacts in the oil & gas and coastal engineering markets. The deep-water oceanography project was our first contract and we are currently in the third of three years on this contract – we will continue to work through C&C Technologies on this contract and on the upcoming three-year renewal. Woods Hole Group designed the deep water moorings and configured the instrumentation to meet the client’s needs. C&C Technologies procured all of the equipment and imported the equipment to Brasil. 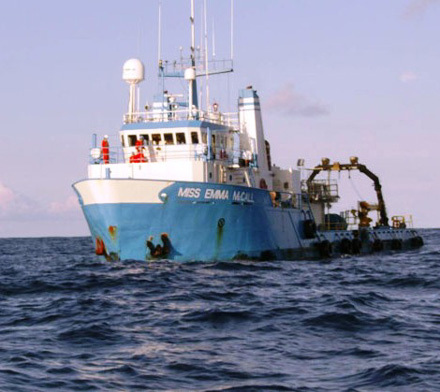 C&C Technologies operates the R/V Miss Emma McCall, which is the contract support vessel and provides all the logistical support and additional technical and administrative support on this contract. 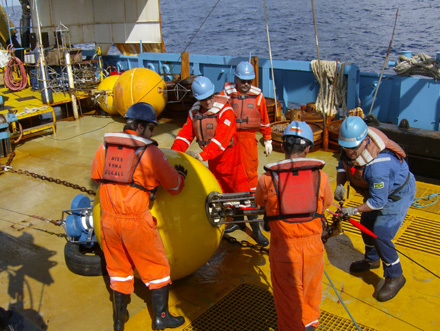 This project gathers ocean current measurements and CTD information as directed by Petrobras and consists of the design and servicing of deep-water, taut wire moorings. Over the course of the last 2.5 years, the configuration and locations of the moorings have changed multiple times. The water depths have ranged from 150 M to 2250 M. The data recovery rates have been high (90%+) and the client is pleased with our work and support on this contract. Woods Hole Group takes the technical lead on the onboard work and has processed the data from all of the moorings for the last 2.5 years. We also take the lead on technical discussions with the client, Petrobras, who uses the data for planning offshore oil and gas exploration and production activities. There are two parts to the Petrobras O&M contract – the first part is to ensure all 26 platforms are operational to Petrobras standards. This will involve repair of existing infrastructure, installation of new equipment on specific platforms, and system documentation of all platforms. Once the platforms have been inspected and accepted by Petrobras, we start a routine 3 month rotation of preventative and emergency service actions – similar to what we do for NOAA PORTS. This will include platform documentation and reporting requirements associated with service trips. These programs will be run by our local staff members. Our office in Recreio (suburb West of Rio de Janeiro) will be headed up by André Vitta. André has a MS in Physical Oceanography and is fluent in English. 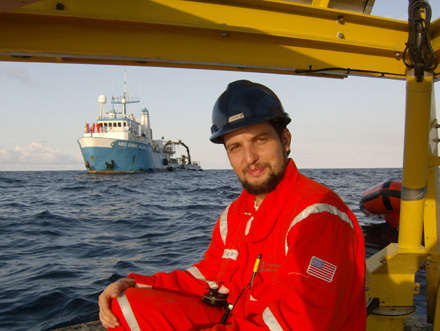 André has been our lead person on the oceanographic mooring contract for the last 2 years. André will continue to be the Project Manager on these two contracts as well as the General Manager for the Brasilian operations. The O&M contract will require immediate staff expansion. Dr. Ivan Soares (Ph.D. University of Miami) is also part of the organization. Ivan’s background is in Coastal Engineering and Modeling. Ivan has strong ties to Port and Harbor developments (of which there are many ongoing and pending) and also to the Environmental Licensing issues in Brasil. Ivan will form the basis of the Business Development team in Brasil supported by André and others here in Falmouth. We expect to diversify our local service offerings and client base with Ivan's leadership. The Woods Hole Group Brasil office is in a suburb of Rio de Janeiro known as Recreio Dos Bandeirantes. The office will allow us to operate independently in country. The continuing partnership with C&C Technologies allows both companies to leverage on infrastructure and staff more than 100 people on joint projects. 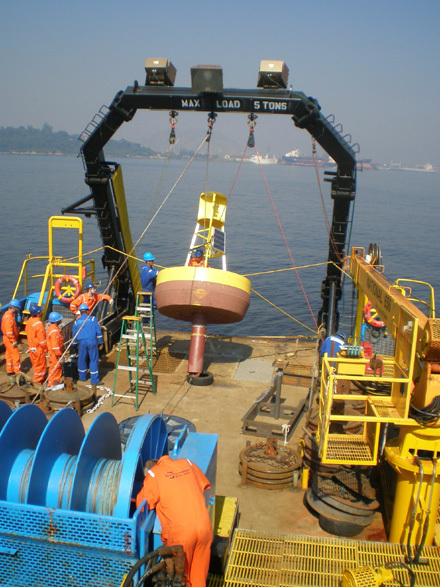 Deep Water Mooring Operation in Brasil. Recreio also will be the location of the Olympic Swimming venue and other venues for the upcoming 2016 Olympics. The 2014 World Cup in combination with the 2016 Summer Olympics is encouraging Brasil to spend large amounts on infrastructure projects. Roads, subways, and hotels are all being built now. It is very exciting to see the area change from visit to visit. The future looks bright for Woods Hole Group in Brasil – Petrobras is the primary driver for our near term activities. Petrobras has three main areas of business opportunities for Woods Hole Group: Engineering, Operations, and R&D. However, oil is not the only game in town -- the mining industry is huge in Brasil and there are major port expansions planned for a new class of export vessels that need harbor deepening to 25 m. The legislative branch of the Government is pro-Green and environmental laws are stringent. EIS preparation is another area that Woods Hole Group can support. Brasil just elected a new female President (first for Brasil) and she was the supported successor to Lu La who ended his 2 terms as the most popular president ever in Brasil. The political process in Brasil is addressing a host of social issues and at the same time – being pro business development. As about 50% of the profit from Petrobras (Brasilian Government is the majority share holder) cycles back into Brasil, the oil and gas economic engine is very strong and supported politically in Brasil. Overall, the developments leading up to the registration of Woods Hole Group-Brasil have been very positive and rewarding. 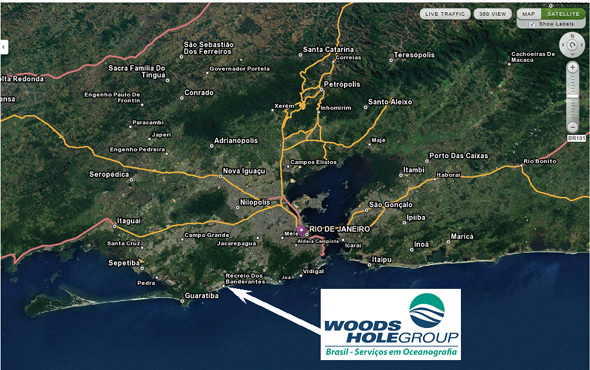 Woods Hole Group do Brasil looks forward to contributing to the over success and growth of the company. Robert A. Catalano, M.B.A., B.S.